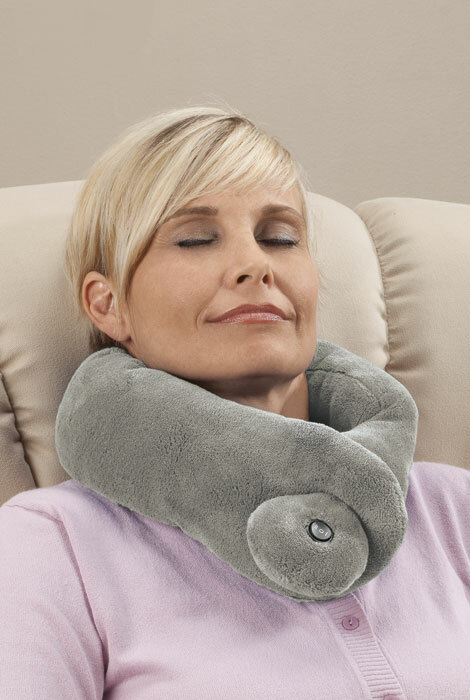 Indulge in the luxury of a plush neck wrap with built-in, vibrating massager. Soothes away stress and tension from neck, shoulders, anywhere—simply wrap and adjust ends, switch on high or low and enjoy! Massaging neck wrap uses 2 AA batteries (not included). 50% velvet/45% cotton/5% plastic; spot clean. 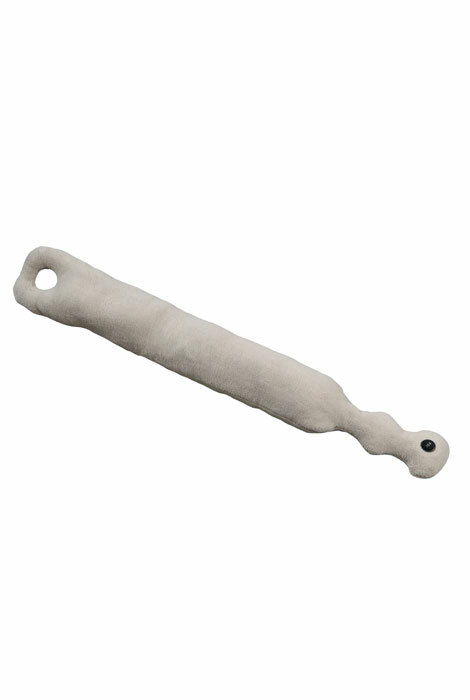 31 1/2" L x 4" W x 2" H.
My favorite neck massager ever! I think I have had this neck massager for around five years. I live with chronic pain in my neck and my back. A lot of times this massager will just cut off the pain and relax muscle spasms in my neck and back that can otherwise only be controlled with heavy drugs. This is a soft product with massagers built in so it's very gentle to begin soothing painful muscles.The shiatsu types are often too intense for my pain level. 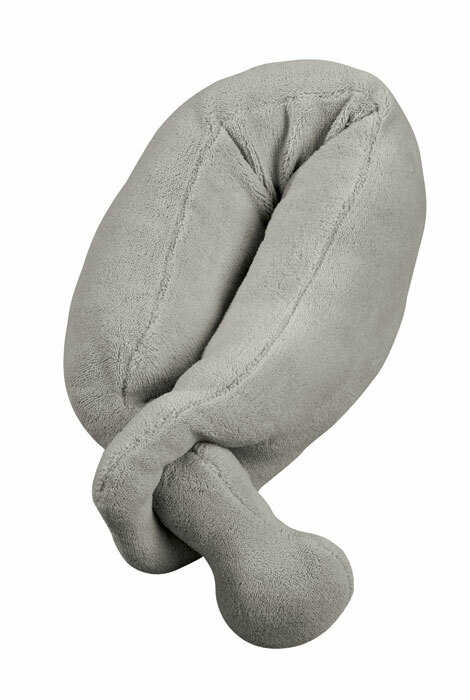 I've tried other neck pillows, but not one that massages my neck. I intend to try this while working on my desktop computer. It helps me to relax! it looks like just what I need for my neck. Because I have one already and it quit working and I love it! I got one a bit ago from a catalog but somehow it got lost and I really liked it and was glad to see it again! My wife love this massaging neck wrap. I have been looking for this for about 3 months. I so happy you guys have it. Only one review but person liked. Willing to try. Great price and neck support. Hi pain level in neck and shoulders. I chose this neck wrap just to pamper myself a little while watching television. Neck pain. Wanted vibrating and light weight for traveling. Only thing comparable I found in Google search. Price also right. Where do you put the batteries in? BEST ANSWER: About 9" from the on/off switch, toward the center of the wrap, you should find a zipper pocket. Unzip and pull the black box out, one side of the box slides off so you can install 2 AA batteries. Very easy. Small zippered pocket houses a small plastic battery box. BEST ANSWER: Because of the natural grains and herbs inside of the wrap , submersion in water would damage or diminish the unique qualities of the product. However, it easily cleans with a damp, soft cloth and a small amount of soap. Thank you for your question. Machine washing can ruin the item cause of the inside mechanics and stuffing. It is recommended to be wiped clean. We hope this information will be of help to you.